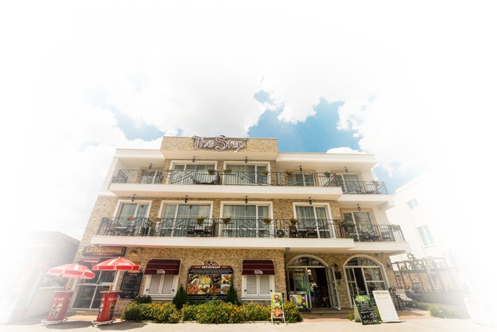 Family Hotel "The Step"is located on the main street in the most southern eastern part of Sunny Beach resort, Bulgaria, within 7 minutes walking distance to the andy beach and the promenade and in 500 minutes from the town of Nessebar. Just outside the hotel is the local buses stops and themini train stop. The hotel features a cozy restaurant with a summer BBQ garden that offers traditional Bulgarian and Mediterranean food .Buffet lunch is available for the guests.. The hotel comprises of 5 one bedroom suites and 6 double air-conditioned rooms, with a furnished balcony, and free Wi-Fi in all areas. Please, have a look at the photoes taken from our hotel - an excellent choice for a summer holiday in Bulgaria , Sunny Beach ! Accommodation in a double room is suitable for two adults and a child .Cots are available for free of charge . A one bedroom suite is an excellent choice for families with 2 children .